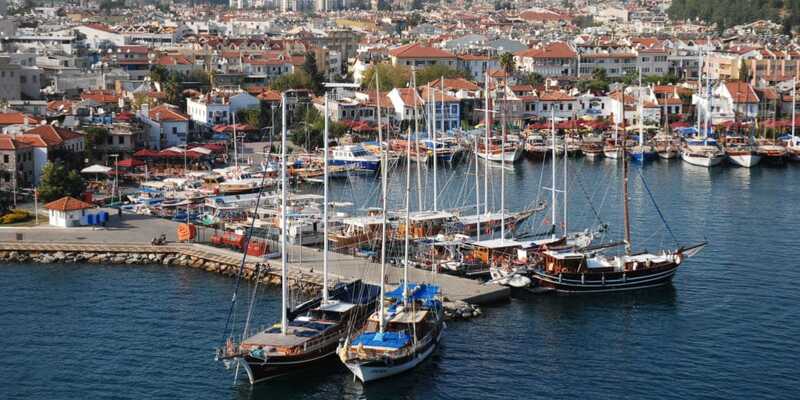 Island hopping is one of the most favored charter boat holidays in Turkey. Many travelers will find that their itineraries can become quite colorful and fulfilling. 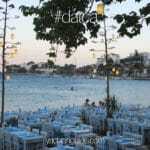 In the Mediterranean region of Turkey, you won’t find many islands, as you would in the Aegean of Greece. However since both countries are so close to each other, it’s easy to embark on your boat vacation from Turkey and set course to the west in the Aegean sea. Although the direction is to the west, there are many combinations in planning an itinerary for your family or group of friends. Marmaris harbor aerial view, Muğla Province, southwest Turkey, Mediterranean. The major ports to embark from in Turkey are Gocek, Fethiye, Marmaris and Bodrum; where Marmaris and Bodrum are the closest to the Greek Islands in the Dodencanese. However charter boats from Turkey can travel as far as the Cretian islands to the south and all the way to the spectacular island of Cyprus. It all depends on the type of boat rental you choose as well as your budget. There is a good selection. 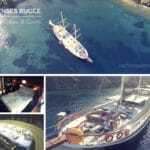 While some travelers like to keep it simple and hire a gulet charter in Turkey. For a 7 night boatt charter in Turkey, itinerary choices to the islands of Greece can begin in anyone of the above listed harbors and continue along the coast to the Eastern Mediterranean or to the Western Mediterranean and then over to the Aegean sea where many of the islands are located. Favorite islands to include might be the largest of the Dodecanese islands, Rhodes. Here travelers can find so many interesting areas to visit. Shopping is always a popular choice for buying souvenirs, local and traditional items to take back to your home country. Rhodes is considered among the most popular islands in Greece and quite well known for the variety of beautiful beaches, lush green landscape, the traditional villages and the ‘Old Town’ in Rhodes, one of the most well preserved medieval towns in Europe. For a more peaceful change, Symi Island is also an exceptional place to visit during your yacht holidays from Turkey. The Greek island of Symi is a warm and friendly island with a population of only around 2,500. One of its alluring features is that it has not been spoiled by mass tourism. As you approach Symi you will notice that it has held on to its traditional Greek island way of living. You won’t see tall buildings, no major villa complexes. It is simply an island with traditional Symian houses, some of which were once the original mansions of wealthy sponge merchants – renovated with modern conveniences. It is quite picturesque with a slow paced lifestyle. 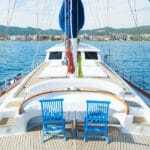 A great place to relax and enjoy during your island hopping boat charter holiday from Turkey. These are just a few fantastic islands to visit. However certainly not limited to just this selection. Many more islands that you and your family or friends can hop to can include, Santorini and Mikonos in the Cyclades with other example itinerary possibilities. There are also the charming little islands in between. 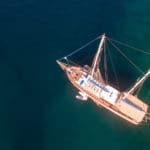 All you have to do is select the type of vessel for your Turkey charter boat holidays and then work on planning your itinerary with your charter agent. All boat cruises are flexible and go at a very relaxed pace. There is no set schedule. You have one whole week to hop and cruise as you wish – as per the Captain’s ‘ok’ as well!